The redoubtable Institute for Fiscal Studies has published a really powerful fresh analysis of the gender pay gap. They have used three large longitudinal datasets – ones that track people over time, and so give much greater insights into what causes what – to unpick the factors that cause the gender pay gap to develop as it does over people’s working lives. It’s the kind of evidence that packs a real punch, and although it’s complex the IFS gets it across about as accessibly as it can, with some really useful charts to help us out. 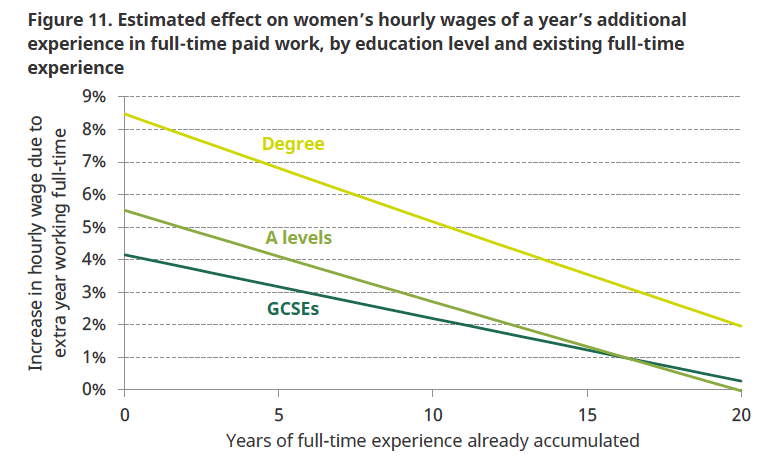 the effect of extra part-time work on women’s wages is negligible. For example, if you are a woman graduate with 7 years experience before having a child, and you add on an additional year working full-time, this brings you an income advantage of 6%. If you have just A levels, it brings you a 3% uplift. This is shown in the IFS Fig 11 below. But if you work part-time – even substantial part-time of over 20 hours, there will be no advantage at all. There’s much more in the report, and I hope to get back to it in another post. But I wanted to get this one out quickly, given all today’s hoohah around pay discrimination and the Tesco women.